Fant, Clyde E; Reddish, Mitchell G (2008). Lost Treasures of the Bible: Understanding the Bible Through Archaeological Artifacts in World Museums. Wm. B. Eerdmans Publishing. ISBN 9780802828811. Curtis, John; Razmjou, Shahrokh (2005). Forgotten Empire: The World of Ancient Persia. University of California Press. ISBN 9780520247314. Rassam, Hormuzd (1897). 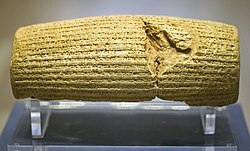 Asshur and the land of Nimrod. New York: Rogers, Robert William.